International Poster Gallery announces an extraordinary event with Arnold Skolnick, designer of the iconic 1969 Woodstock poster, to celebrate the 40th anniversary of The Woodstock Festival. 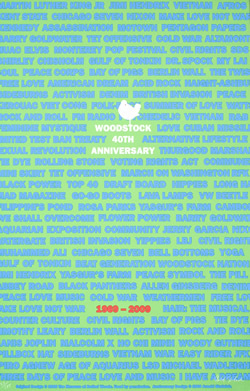 Mr. Skolnick will be on hand at the Gallery to sign both original Woodstock posters and a new original limited edition poster created by the artist for the 40th anniversary. The new poster is a time capsule in and of itself and cleverly references the original poster as well as the era of psychedelic posters in a modern way. The event, which is free and open to the public, takes place at International Poster Gallery, 205 Newbury Street in Boston, on Thursday, August 6th from 5:00pm to 7:30pm, and will feature a talk by Mr. Skolnick at 6:00pm. RSVPs are requested at Woodstock@InternationalPoster.com. Regular gallery hours are Monday through Saturday 10 am to 6 pm and Sunday noon to 6 pm. Call (617) 375-0076 or visit www.InternationalPoster.com for information. You always have an option to buy posters online nowadays. Skolnick’s Woodstock poster played an essential role in the success of the largest rock festival of the Sixties, an event that was as famous for its freedom from violence as it was for its unparalleled musical line-up. The poster perfectly expressed in one symbol – a dove perched on a guitar – what Woodstock was about. Despite the need for lengthy text, the poster was graphically succinct and struck an enduring chord with a generation and indeed the world. The poster’s text is also a treasure trove of juicy memorabilia – the $18 3-day ticket price, the list of performers from Jefferson Airplane, Jimi Hendrix, The Band, Santana, Creedence Clearwater Revival, Joan Baez and many others, as well as “dozens of curious food and fruit combinations to experiment with”. The original poster was no accident. Skolnick was a talented Madison Avenue advertising director and was skilled at hearing what a customer wanted and needed. Mr. Skolnick recalls, “The client said he wanted the event to be ‘peaceful, three days long and a lot of music’ so that’s what I gave him.” His design was the perfect solution to a licensing problem that required the festival to be relocated at the last moment from Walkill to Max Yasgur’s farm in Bethel, New York. The psychedelic and countercultural tone of the aborted venue’s initial poster was replaced by a more subdued and peaceful message so the event would not be banned again– thus creating a unique rock poster for the ages. Last year, International Poster Gallery acquired a small cache of original Woodstock posters. These authentic1969 posters will be available for signing by Mr. Skolnick at the gallery. The artist has also created a beautifully printed 40th Anniversary silkscreen especially for this event, printed in a limited edition of 285 signed and numbered posters. It is offered at the event for $200 and thereafter for $300. This poster is exclusively available through International Poster Gallery and cannot be acquired elsewhere. In addition to gallery shows and special events, IPG’s award-winning website, http://www.InternationalPoster.com offers the largest, most comprehensive online collection of fine vintage advertising posters in the world. Originally launched in 1998, the site now contains nearly 5,000 images accessible through a powerful search engine.